First Aid: What would happen today, if there was an accident at your workplace? Would employees and management know what to do? Would the injured person get the best possible care? When an accident happens, a first aid program that meets the requirements of the law and is tailored to the type and size of the workplace can literally make the difference between life and death, or between recovery and permanent disablement. Employers should insure that all employees know where emergency information is posted at the work site. The emergency notice should state the phone numbers of the closest ambulance service, fire/rescue unit, police station, and hospital. The amount of time it takes to look up one of these important numbers can make a big difference to a seriously injured person. 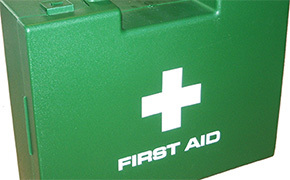 The location of first aid equipment and rescue equipment, should also be posted prominently.